A friend of mine from Israel once looked at me in astonishment when I played him an Israeli song that really hit the spot with me. "That song is about five years old!" he said in astonishment. "It's an old song!" "A song is new when I first hear it." I replied. Fruits and vegetables go stale. A song does not." I then reminded him that it is harder to keep up with Israeli music when one is not fortunate enough to live there. After that, he turned me on to some good mizrachi music, which is Jewish music of Jews from Arab countries. It I had to only listen to one kind of music, that would be the kind I would choose. There are radio stations in Israel that play such music all day long. In such a tiny country are Jews from around the world. Their food, their music and art are all within reach. There is one group that has been around since 2002 in Israel that epitomises the fusion of subcultures within Judaism. This group, which is named after its founder is known as the Idan Raichel Project. at its core is a group of songs that fuse Ethiopian and Hebrew language and musical forms within the same songs. Raichel was born into an Ashkenazi family. He discovered his musical talents at an early age. During his military service, he joined a military musical group, which entertained at various bases and played in a variety of styles. Upon his completion of military service, he worked in a home for troubled youth, many of whom were Ethiopian immigrants. This opened for him musical vistas. Despite having a remunerative career as a backup musician and vocalist with top musical talent in Israel, Raichel yearned to establish a group that would reflect his unique perspective and eclectic tastes in music. When he finally established the Idan Raichel Project in 2002, his musical vision became a reality. It touched a responsive chord in the hearts of Jews in Israel and around the world. His songs cross linguistic and stylistic boundaries. Most people contribute to the cultural mosaic by staying within their own circle s and maintaining their way of life. Other people cross boundaries. They might be comfortable among different types of people, or sense the underlying universal common denominators in the human experience. Creating musical expressions of this transcendent outlook is a rare talent. I was a natural searcher. Converts and Baalei Teshuvah (people who become Jewishly observant later in life) have already crossed boundaries of belief and cultural expression. There is a bit of a psychological common denominator with immigrants. Staying within the way of life I was born to did not seem natural to me. It was in my bones to question. When I looked out at the ocean, I always wondered who was looking back at me from the other side. It is to this aspect of my soul that Idan Raichel speaks. When I listen to his music, I feel it gives lyrics to the yearnings of my youth. His music creates bridges between cultures. It is unique music that is reflective of a unique country. 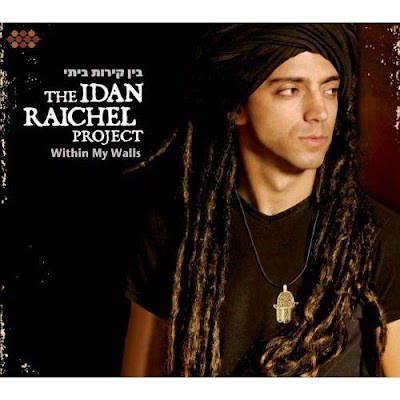 Thank you Idan Raichel.